Maastricht is the oldest city in the Netherlands, peacefully perching on the banks of the Maas River. It is also one of the sunnier spots, located at Holland's southernmost point, squeezed in between the Belgian and German borders. 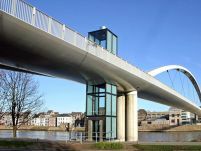 Once a humble Roman settlement, Maastricht now boasts almost the highest number of national heritage sites in the Netherlands, second only to Amsterdam. The city is not just notable for its age and history though: Maastricht is the birthplace of the European Union and the single European currency, the Euro. Ancient fortifications provide pleasant walking routes and some of these can be explored on the city's western outskirts. The Bonnefantenmuseum traces the city's historical roots, and makes for a good introduction to the city. Another must-see is the Basilica of Saint Servatius, a medieval cruciform basilica with a significant collection of religious artefacts, as well as being the burial place of Holland's first bishop. In the old centre of Maastricht there is a selection of shops and department stores and it is known as a good shopping destination. Here one can also savour the fine food and wine that Maastricht has developed a reputation for. Maastricht is a university town with a large and vibrant student community that adds energy to the ancient city.